Another elegant offering Susie; that vase is gorgeous. I do like these Camellia sasanqua, I’ve just bought a white one for the terrace and it is flowering so prettily. Christina, I’ve been wanting a white camellia too. Do you know its name? This camellia bush is rarely blooming all over at once. It’s a real treat to see it in full bloom without frost touching it. We’ll be i the 80s this week. It is sunny and warm here today too, but not the 80s! I’ll check to see if my Camellia has a variety and let you know. You are so lucky to be able to grow Camellias. So beautiful. Thanks. The warm autumn has allowed this camellia to flower beautifully without frost damage–rare for us. Thanks Cathy. I like C. sasanqua for its fall bloom time. This one is very fragrant–another plus. I love that Camellia! I wish I had one with multi-colored flowers or simply a mix of sasanqua in different colors but all mine are the same muted pink color. Would love more also Kris. My other sasanqua is Yuletide. Planted these without knowing anything about growing camellias–beginner’s luck. Since then I’ve planted others but they haven’t survived. See above, I love Yuletides, my favorite ever! This is beautiful in its simplicity. My Cactus Zinnias have just set bud, but are terribly gangly. Just loving all the Camellias out now…and so many buds this year! I’ve never seen your multi-colored one and love it. This weather is wonderful, except I have to remember to water. Simple elegance–the perfect way to describe it. That vase is exquisite! Thanks so much Beth. Bought three vases in this style this summer with integrated floral pins. I like working with them very much. Thanks Cathy. Petals are starting to drop already, but somehow adds to it. 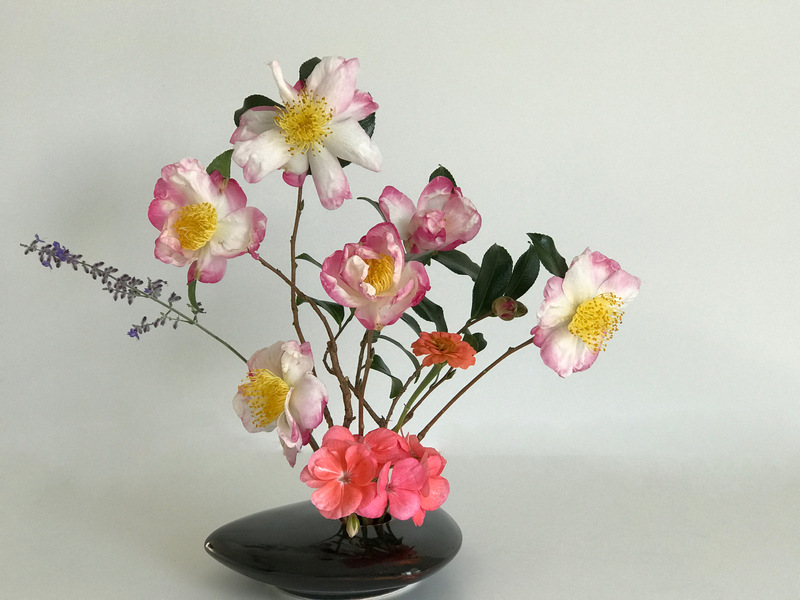 A master of Ikebana!I love those camellias! Thanks Anca. 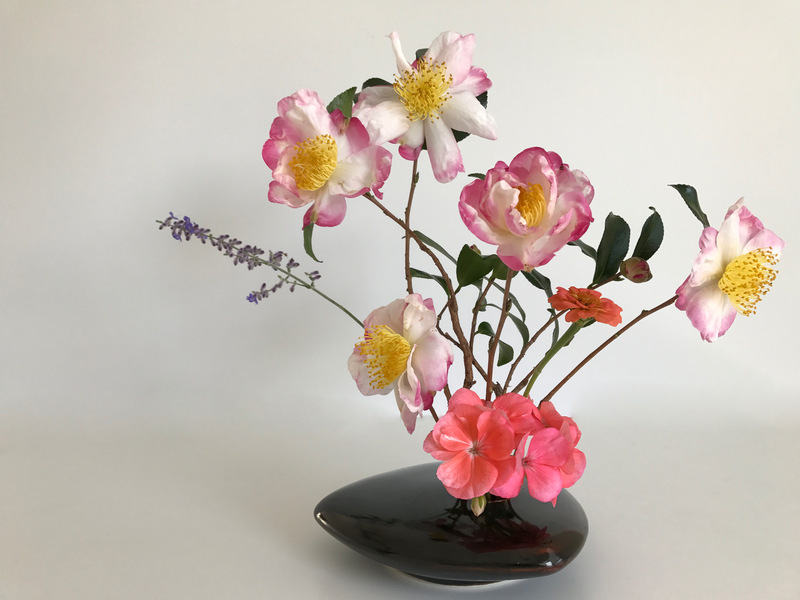 Would love to study ikebana some day. Meanwhile the special vase helps create a suggestion of the actual thing. These camellias smell lovely. What a beautiful camellia to grow. It looks perfect floating over that lovely shiny vase. I do wish our soil wasn’t so alkaline. Love the pink and white Camellias. Me too. Have crinkly texture and nice fragrance. Your Ikebana-inspired arrangements are so artistic and allow each individual blossom to strut its stuff. Thanks Ricki. I enjoy this vase because the integrated pin holder makes it easy to hold stems in place and look a little bit planned. Such a pretty camellis, I love these autumn blooming sasanqua hybrids. And as usual you have created a really elegant arrangemenrt. Thanks so much. It’s great to have a way to keep flowers going throughout the year, camellias are a big help.